I'm adding "making a quilt block into a mini quilt" onto the "things I love to do" list. In the Meadow quilt class taught by Lizzy House, we made practice blocks to learn the techniques (P.S. make sure you bring practice fabric!!). Since I did not, I quickly threw together some fabrics I had brought for my real quilt. I used this pretty daisy print by Daisy Janie as the central focus, and a favorite wavy background print (I don't know who made that fabric). 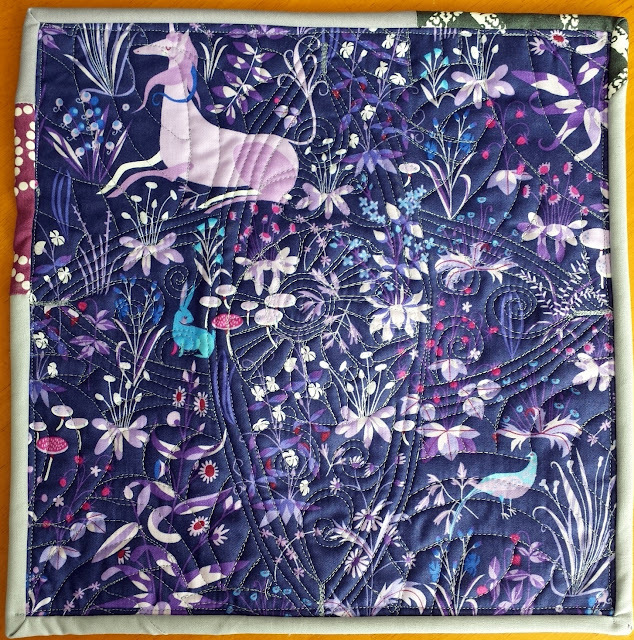 The periwinkle fabric actually serves as the centers of my real Meadow quilt. This is a practice block, so it is NOT perfect. I'm not afraid to admit that! 3 out 4 four points (1 more than others) got chopped off. Now that I've practiced the technique more, I'm hoping that the real quilt won't be so drastic. :) Since this is my mini and it's hanging on my sewing room wall, I don't really mind that the points don't exist. Just have fun, right? I had a lot of fun with the quilting, and I'm considering quilting the petals (or eye) of my actual Meadow quilt like so. I used my free motion quilt for everything. Those curlicues have me all excited for more! I traced the purple curves in the background with purple Aurifil, and I traced the middle daisies. I've been doing a lot of thread tracing lately... fabric is so beautiful. A hidden unicorn! :) I really wanted to keep some of this Lovely Hunt fabric by Lizzy House (because surely I'll be using it for my nieces). So there we go. I know, the horn is cut off a little, but this one was on the edge of my fabric. It still counts, right? Here is it is on my mini wall! If you missed the tour, you can catch it here (and on Periscope - I'm @quiltyhabit - until 9:20 pm EST on 10/8!). This was a selfish sewing project that was more than gratifying! Thanks for reading! It's such a cute little quilt! Great way to use the practice block. so pretty Jess! I didn't even notice that the points were cut off until you pointed it out. I love the quilting and how you traced the lines in the background. The colors are gorgeous! 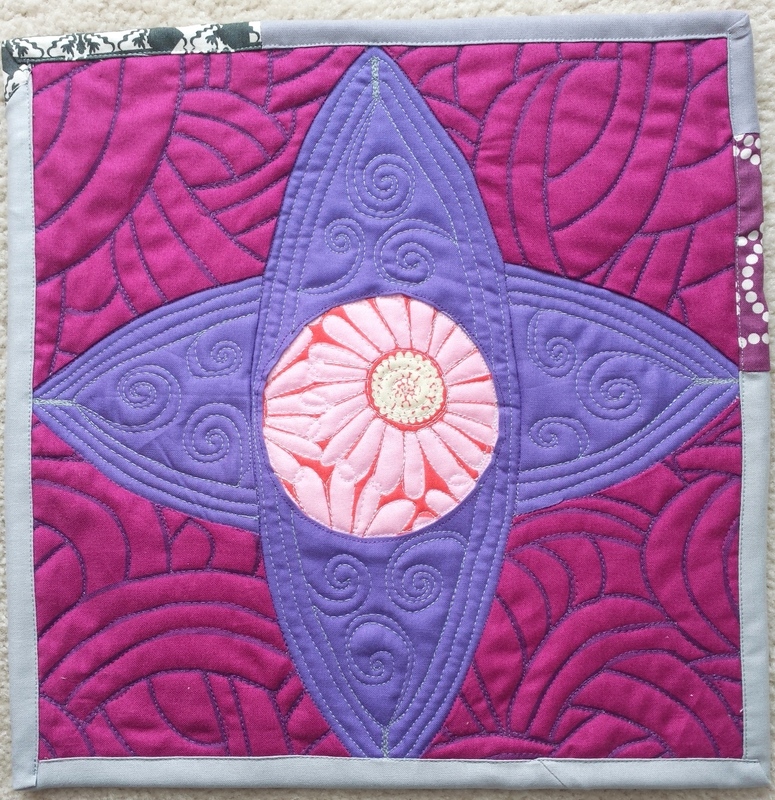 I think you did a wonderful job, especially love the quilting! Since it's a practice block, there are always things you learn when trying a new pattern/block. 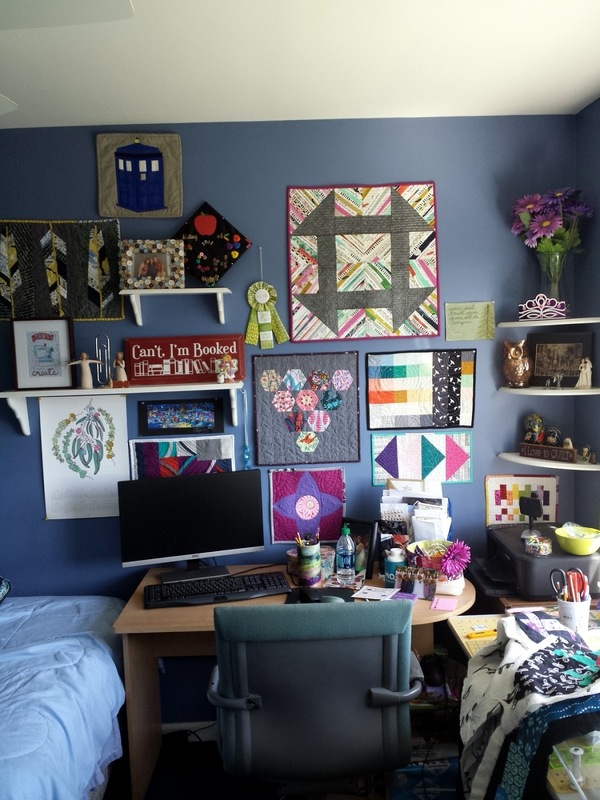 Your quilt wall is amazing...what fun! 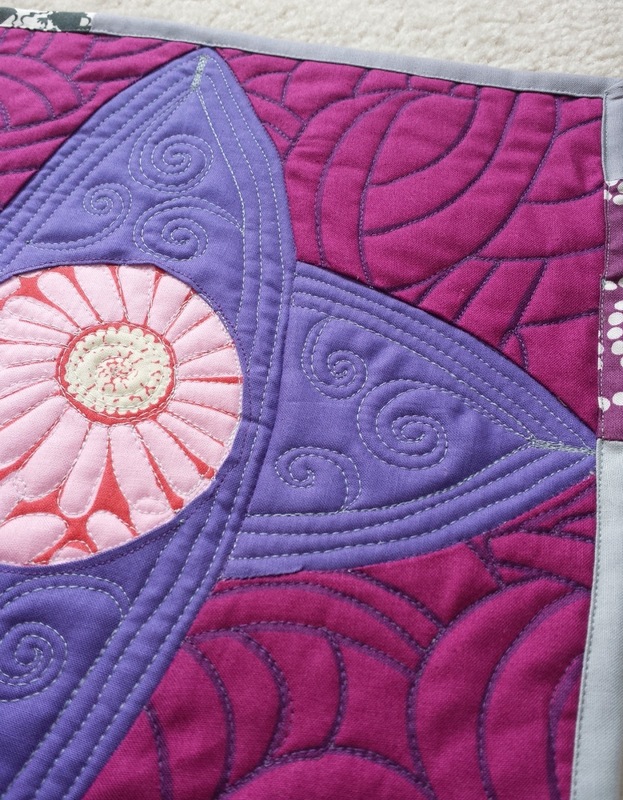 Love the quilting you did on this, Jess! Gives it such great definition and dimension. Wow! Great mini! Small projects are so much easier to free motion quilt, and this turned out lovely, points or not.